The EHR is by far your hospital’s single biggest IT expenditure, but are you truly seeing a measurable return on that investment? As a system of record, the EHR holds valuable patient information. That’s the (relatively) easy part. The hard part is taking that information and putting it to work at the point of care. This is where a well-implemented Clinical Communication & Collaboration (CC&C) solution can pay dividends. 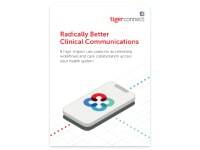 For what is comparatively a tiny fraction of the cost, a clinical communication solution can help unlock substantial productivity from the EHR by connecting key staff and making patient data actionable in that last mile of care. A CC&Cs key difference lies in its ability to effectively merge system-generated data within a clinical messaging layer that is both smartphone-friendly and easy to use. Here are four ways Clinical Communication and Collaboration (CC&C) platforms close the gaps in EHR functionality to save time, boost productivity, and deliver true EHR ROI. Imagine if only half the athletes on a sports team could communicate with each other. The odds of winning a championship would be all but impossible. Too often, that’s the situation for health systems where multiple EHRs are being used. And since caring for patients requires the time and energy from both clinical and non-clinical staff across a range of facility types, not connecting everyone on a single platform seems like a recipe for trouble. So it’s no surprise when we see longer ED wait times, lower bed turnover, slower discharges, and a higher incidence of medical errors during patient transfers. This is where a CC&C’s magic kicks in. CC&C’s connect the entire health system – including clinical and non-clinical staff – all on a single platform in an easy, flexible, fully integrated way, and at a fraction of the cost of an EHR license. 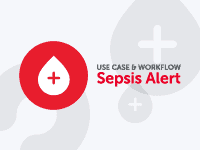 By centralizing data (EHR, nurse call, alerts, etc.) from disparate systems and vendors, CC&C solutions seamlessly blend real-time patient information with robust communication capabilities into a single, easy-to-use, mobile-friendly experience. This fast access to information and people helps staff do things like coordinate patient transfers between facilities, resolve medication issues, or message a PCP when his or her patient gets admitted to the hospital with heart issues. Service interruptions and EHR outages are inevitable. Weather events, malware attacks, hardware failures – any one of these can bring an EHR down and take your communications with it. Because advanced CC&C solutions are cloud-based and operate on their own separate channel – LTE or WiFi – they bypass this risk and keep communication flowing during a crisis, when it’s needed most. Teams can continue to message and collaborate while broadcast messaging keeps the organization informed of things like system status, threat levels, and situational updates. Executive staff can strategize asynchronously in real-time without relying on email or endless phone calls. Determining the best treatment for a patient isn’t always a clear-cut process. Sometimes, the discussions among colleagues include details that aren’t necessarily beneficial for a patient to read in their medical record or on a patient portal. Most EHRs require these conversations to take place within the patient record, forcing clinicians to be very measured in what they say and how they say it. Once again, here’s where CC&C solutions step in to assist. CC&C’s allow staff to conduct detailed conversations about patients knowing that none of the details will become part of the patient’s record. This facilitates freer, more clinically honest communication without the fear that a comment may be taken out of context by a patient or loved one who may read it. Many of the more advanced CC&C solutions offer the flexibility of capturing and saving select responses back to the patient record through a custom EHR integration. The massive consolidation happening in healthcare today is creating a mash-up of post-acute, ambulatory, skilled nursing, physician groups, and other organization types all using a mix of EHRs and other systems. This increasingly disconnected state heightens communication challenges for everyone involved and keeps staff mired in an endless cycle of logins, voicemail, pagers, answering services, fax machines, and whiteboards when coordinating care. Meanwhile, many CC&C’s offer accessible APIs and developer-friendly code libraries that allow for seamless integration with the widest range of hospital systems. 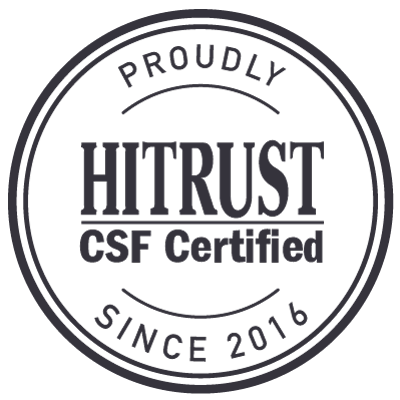 While the major EHRs struggle to integrate with nurse call, answering services, or scheduling systems, CC&C solutions excel at seamlessly merging the most relevant real-time patient data with human-to-human communication, minimizing trips to a workstation and streamlining care coordination. 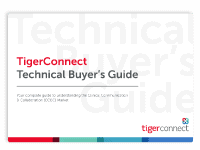 To see the other four ways CC&C solutions, like TigerConnect, unlock value from the EHR. Download our eBook here.